NEW YORK  It's the morning rush in the Times Square subway station, a routine convergence of humanity and mass transit that makes New York City hum. Mixing seamlessly with subway riders are New York Police Department officers with heavy body armor and high-powered rifles, commanders in blue NYPD polo shirts carrying smart phone-size radiation detectors and a panting police dog named Sabu. "This is the new normal," Inspector Scott Shanley of the NYPD's Counterterrorism Division says. "The only people who sometimes get raised up are tourists." Since terrorists brought down the twin towers on Sept. 11, 2001, subways have been bombed in terror attacks across the world, including in Madrid, London and this spring in Minsk, Belarus. The possibility that New York's sprawling, porous and famously gritty subway system could be next has become a constant worry  leading to a new normal of suspicious package alerts, bomb-sniffing dogs, cameras trained on commuters and passengers listening to the missive, "if you see something, say something." The campaigns encouraging residents to report suspicious activity strike Manhattan writer Anne Nelson, 57, as Orwellian. "New York is about expression and life and vibrancy," she said, walking through Times Square. "It's not about living in an atmosphere of fear." But authorities here believe a serious attack on the 24-hour subway system with more than 400 stations, would potentially cripple the city in ways worse than the Sept. 11 attack  a concern shared in other countries reliant on mass transit and viewed as enemies by terrorists. The human toll  going back when the Aum Shinrikyo cult's 1995 nerve gas attack killed 12 people and injured thousands in Tokyo's subways  has already been devastating. In Madrid, Islamic militants set off 10 backpack bombs on the commuter rail network in 2004, killing 191 people and wounding more than 1,800; in London, another suicide bomb strike killed 52 commuters and injured 700 in the city's deadliest attack since World War II; and earlier this year in Minsk, a remote-controlled bomb killed 12 people and wounded 200 in the city's main subway station. In New York, no one has pulled off an attack, but there have been plenty of scares. Last year, a homegrown al Qaeda operative, Najibullah Zazi, pleaded guilty to plotting a suicide bomb attack timed for rush hour to cause the most bloodshed. The former airport shuttle driver told a judge his plan was "to conduct a martyrdom operation on the subway lines in Manhattan as soon as the material was ready." The NYPD also foiled a 2004 plot to bomb Manhattan's Herald Square subway station. And there were reports in that al Qaeda considered a cyanide attack on the subway system in 2003. New York's subway system, the largest in the country, has more than 465 far-flung stations, most with multiple entrances, and 800 miles of track that would stretch to Chicago if laid end to end. Last year, it carried 5.2 million riders on the average weekday  well more than double the number of travelers who pass through U.S. airports each day. "It's really a potentially very vulnerable environment  one that you can't totally protect," said William Bratton, a Kroll security firm executive who's headed New York and Los Angeles police departments and was chief of the New York City transit. "That's the reality of it. ... It's a unique challenge." Police Commissioner Raymond Kelly has said the NYPD tries to meet that challenge by going to "extraordinary lengths" in the subways each day "to make our presence seen and felt in different ways, giving would-be terrorists and common criminals cause to think twice." "We have a lot of ground to cover," he says. Pre-9/11, covering that ground meant mostly fighting conventional crime  from robberies and assaults to fare beating and drug possession. Post, the department has asked its 2,500 uniformed and plainclothes transit officers to fight terror as well. Officers have been given training in how to spot terror suspects casing the subways. They've also been instructed to be on the alert for people walking in a stiff manner, sweating heavily and talking to themselves  signs of a potential suicide bomber. The counterterror arsenal includes more than 30 bomb-sniffing dogs; silent alarms and motion detectors intended to prevent tampering with ventilation systems to make a chemical or biological attack more lethal; and a vast system of security cameras wired with live feeds from Penn Station, Grand Central Terminal and Herald Square. More new normal: Random bag checks  once challenged in court as a civil rights violation  are done tens of thousands of times each year in the subways with barely any complaints. The department uses high-tech detection devices to screen riders for peroxides or nitrates common in homemade explosives, sometimes with the help of agents on loan from the Transportation Safety Administration. The security strategy also includes regular inspections of tunnels under the East River, and sending officers periodically onto subway cars, asking passengers to beware of suspicious package. The roving teams can calm commuters, discourage would-be attacks or disrupt plots already set in motion, police say. Police rely on counterterrorism drills to stay sharp, said Shanley. One exercise involves having an undercover officer with a mock device, stashed in a backpack and emitting gamma rays, slip into the subway to test the ability to detect and neutralize a real radioactive threat. Above ground, NYPD analysts constantly mine for intelligence about potential plots that can dictate how it deploys forces. The department has dispatched detectives to Moscow, Madrid, London and Mumbai, India, to see what lessons can be learned from overseas terror attacks. London's transit system has long been affected by the threat of bombs  there are no garbage bins on the subway or in train stations, for example, a legacy of the years when London was an IRA target. After the 2005 attack, the emergency services were criticized for lapses in their response  confusion, a shortage of first aid supplies and radios that did not work underground. Police have since been issued with digital radios capable of operating throughout the subway system. The biggest change since the bombings has been the decision to equip some members of the British Transport Police officers who patrol the transit network with guns. Most British police do not carry firearms. There also were intelligence lapses. Britain's domestic intelligence service, MI5, had two of the London bombers under surveillance as part of an investigation into an earlier, foiled, bomb plot. They were never pursued because officials were overwhelmed with other threats perceived to be more serious. Home Secretary Theresa May, the government official responsible for MI5, said earlier this year that "a considerable number of improvements" had been put in place since 2005 but declined to give details for security reasons. In Spain, the national rail company Renfe said security measures on that network have in fact been beefed up since the massacre. But it refused to give details, calling the issue confidential and sensitive. Another state-owned company, Adif, which manages Spain's long-distance train stations, said it has assigned more guards at train stations and broadened use of closed-circuit security cameras. It also has sought more coordination with various national and local law enforcement agencies to identify threats. 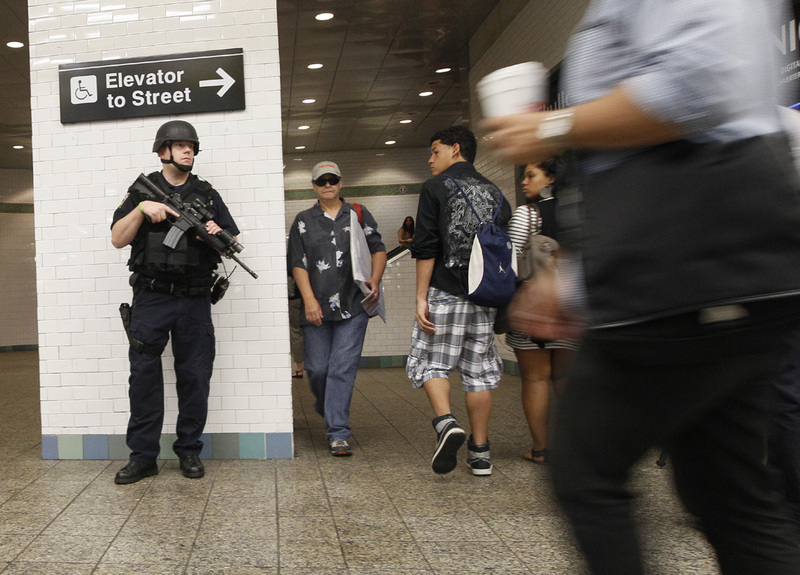 The heightened security in subways has become second nature in New York, though fears persist. At Grand Central Terminal last week, 54-year-old consultant Robin Gant said the threat of terrorism still weighs on her 10 years after the Sept. 11 attacks. "I look at people and who's to judge? You just never know who might be the one," she said. "No matter how safe you feel, you're always on yellow alert."